Can't take credit for this great read...but got this from Tundra Vision....but it's the facts and history worth knowing! The similarities are astounding...know your Packer History! They named our stadium after a man who was fired and ran out of town & Lambeau wanted nothing to do with Green Bay Packers organization till the day he died & Lombardi couldn't stand him and spoke out against him. Breezing through the Packer Blogosphere, there’s precious few days you can go without some headline about Brett Favre, usually accompanied with more conjecture than any confirmed facts. And so it goes, Favre being placed more and more in the crosshairs of Packer fans. He’s a traitor, they say. Spiteful. Disrespectful of all Packer fans. And he might be. Time will tell the story of Brett Favre, and how this messy divorce will be looked back upon. But if history proves correct, Brett Favre will once again be beloved by Packer fans. It’s just going to take time. It’s uncommon for any player, coach, or GM to leave on fantastic terms with his team. Usually, for some reason, one of the two parties ends up feeling a little slighted. When a coach is fired for having a poor record, he usually doesn’t agree with the reasoning, and often, the media and fan base don’t remember him with love and adoration, either. Players bolt in free agency, get traded, or are cut as soon as their usefulness is past. Some of the biggest names in Packer history left with some sort of dark cloud following them. But the bigger the star power, the bigger those emotions become. Ego, power, entitlement, pride: all play a factor in how stars view themselves, how the team treats them, and how the fans regard them. And certainly, Brett Favre had as much star power as anyone. But perhaps one of the biggest stars in Packer history had one of the ugliest divorces from the team. 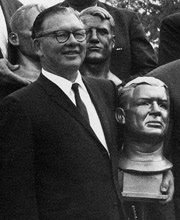 Curly Lambeau, the team’s founder and winningest coach, engaged in a power struggle with the Packer Board of Directors in the late 40’s and 50’s. His 1946 purchase of the controversial Rockwood Lodge as a training camp site set the tone for the board to start questioning his decisions…something the team’s founder wasn’t used to. 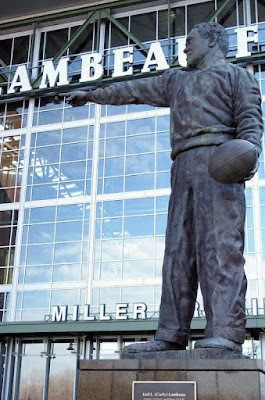 If you think Brett Favre has been “the face of the Packers organization”, imagine how Curly Lambeau had to be regarded. The man organized the team, helped get funding for the team, played for the team, and coached them for over thirty years. And, he was remarkably successful: a 229-134-22 record and six NFL championships. Curly Lambeau was the man. That is, until the Packers Board watched Lambeau suffer through the 1948 and 1949 seasons with a combined record of 5-19, and pulled off a major coup: for the first time in the Packers’ 31-year history, a coach (and vice-president) was fired. And it wasn’t pretty. The power struggle had gone on for several years, and had become a distraction to the team and the fans. And Lambeau didn’t leave happy. In fact, he refused to come back to Green Bay for years, even when invited. He was angry at the Packers front office over how he was treated, how he was let go so unceremoniously. He went on to coach two other NFL teams before finally hanging it up three years later, but there was no happy homecoming for Curly Lambeau. He stayed away from Green Bay, and reportedly, he stated that he did not want to be associated with the organization in any way. As the Packer Board members continued their own internal power struggles throughout the 1950’s, the team on the field also suffered through a revolving door of coaches that left many fans wishing they had Curly back. It wasn’t until 1959 when a new coach finally walked through the door, pounded his fist on the Board table, and stated, “Let’s make one thing clear, I am in charge here.” That man was Vince Lombardi. But as the Packers enjoyed a Renaissance nce in the early 60’s, Lambeau, the father of the Packers, continued his difficult exile from the organization. He was invited back in 1959 for Vince Lombardi’s first game as coach*, but it set up a quiet rivalry between the two. By many accounts, there was no love lost between Curly Lambeau and Vince Lombardi. A couple years ago outside the Atrium, I was standing near the two statues of Curly and Vince while waiting for some friends before a game. An older gentleman struck up a conversation with me, talking about the irony of the statues standing thirty feet away from each other. “In life,” he said, “those two would never have gotten that close to each other if they could have helped it.” And now, they are frozen in time together, even though in the early 60’s, it was clear there was some ego and pride running in overdrive on both sides. Curly had been approached on several occasions by different parties in Green Bay for some sort of honor for his years of service, but Lambeau consistently declined, as he did not want his name associated with the organization. Curly Lambeau died in 1965 with this kind of relationship still standing with the Packer organization, his own 31 years of founding, coaching, and insuring the prosperity of the franchise marred by pride, hurt feelings, and perhaps, spite. But on the occasion of his death, the Green Bay Labor Council began a push with the local media to name New City Stadium posthumously after Lambeau. City officials were hesitant, given the previous rebuffs by the man himself. But there was one man who was vehemently opposed to the idea, and spoke out against a “Lambeau Field” many times in public. That man was Vince Lombardi. Even after Lambeau’s death, the rivalry, spite, and prideful competition continued. In the end, Lambeau’s family approved of the idea, and a groundswell of support for the man who founded the franchise drowned out the catcalls and naysayers. Today, not only do we visit a stadium named for the once-deposed (and sometimes despised) coach, but we admire his bronzed likeness as you walk in to the Atrium and order a cold beverage at the pub that bears his name. Pretty good for a guy who was run out of town on a rail, and who swore never to return. People forget those less savory details as time goes on. They remember how important it is to honor your past, especially when it is the past of the greatest football franchise in the NFL. Today, those who write about the ugly rift between Lambeau and the Packers often sweeten it up with a passing “less-than-amicable split” or a “didn’t leave on the best of terms”. In reality, it was an ugly, permanent divorce, involving a man who was more than just the “face of the franchise” for sixteen years. He was the franchise...for thirty-one years. Not too long ago, history again repeated itself. When Reggie White retired from the Packers in 1998, he did some things that caused the Packer organization to slowly distance themselves from their once-glorified player. First, a speech made before the Wisconsin state legislature was characterized as being racist and stereotyping by critics. Then, he made public statements against homosexuality, and appeared in anti-homosexuality ads in his Packer jersey. These actions caused him to receive a reprimand from both the Packers and the NFL for appearing in his jersey without approval, and lost him a TV commentator spot with CBS. When Reggie White asked for his release in 1999 so that he could un-retire and play for the Carolina Panthers, the Packers didn’t blink an eye and quickly let him go elsewhere. Few seemed to question why he wouldn’t want to come back and play for the Packers (or why the Packers wouldn’t want to make him play with them first). You did not see Reggie White as a regular at Fan Fests or making pre-game sideline appearances. By the time of his death, the Packer Pro Shop no longer carried any White memorabilia or jerseys. There was a quiet rift between the Packers and the player who had brought glory back to Titletown. But when White passed away in 2004, the Packers couldn’t trip over themselves fast enough to bring White back into the Packer family. Within a year, they had retired his number and placed his name in the Ring of Honor inside Lambeau Field, and enshrined him into the Packer Hall of Fame soon thereafter. As we continue to deal with the ugly divorce Brett Favre has had with the Green Bay Packer organization, it is wise to look back on other seemingly immortal Packers who saw the end of their careers end on "less-than-amicable" notes. Most of us today never think twice about Curly’s resentment towards the Packers, or recall White’s exodus from Green Bay. We celebrate them as Packer heroes, men who laid the foundation for today’s Packers to continue to be a part of a storied organization in the NFL. Someday, Brett Favre will receive the same kind of honors: a retired number, a place in the ring of honor, a plaque in the Packer Hall of Fame, and likely, some sort of permanent fixture inside or outside Lambeau Field. Perhaps another practice field or facility will bear his name in large letters as we drive by in our hovercars twenty years from now. People won't remember Greta, or the $20 million dollars, or the Vikings. It’s just the way history works. * the picture you see is indeed of that visit by Lambeau in 1959, but I also show it for another reason: the young man and woman standing behind Curly are two of the greatest Packer fans I know: my father- and mother-in-law, Bill and Gail Phillips, a newspaper clipping that still hangs on the wall in the Phillips basement today.